Tight end Jerome Cunningham, a member of the Tennessee Titans practice squad, hasn’t given up on his NFL dream, in part to inspire his younger brothers not to give up on theirs. “Next man up” is an old football adage invoked after a key player’s injury. 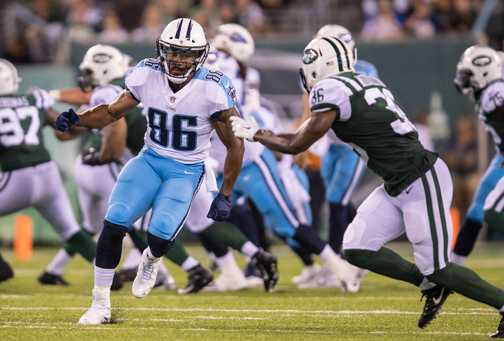 It must have come to mind Sunday evening for Titans practice squad tight end Jerome Cunningham, who has been released 10 times while waiting for the chance to be the “next man up” on an NFL roster. So when Delanie Walker suffered a serious ankle injury against Miami on Sunday – he was placed on injured reserve on Monday – it was natural for Cunningham to assume it was his time. But the Titans looked elsewhere, signing MyCole Pruitt, another journeyman who, since joining the NFL in 2015 after playing collegiately at Southern Illinois, has been employed by the Bears, Vikings, Texans and Buffalo. He’s appeared in 21 games and has 12 career catches. Cunningham, 27, was brought back to the Titans roster for the third time late in training camp but didn’t stick in the final cut. Thanks in part, however, to a blocked punt he had in the preseason finale against the Vikings, he secured a spot on the Tennessee practice squad. That has been a familiar place for Cunningham, who has spent three different stints on practice squads since 2016. Cunningham, whose NFL career consists of nine games with the New York Giants in 2015, has been grinding and hoping for another chance to be on a team’s 53-man roster. So how does Cunningham prepare through the week, knowing there is no payoff in the form of game action for him on Sundays? He stays optimistic and ready. “The biggest thing is to always prepare for that moment, so when that moment comes, it’s not unexpected. You always want to prepare as if you are going to play,” Cunningham says. His chance at the brass ring might just have arrived Sunday with Delanie Walker’s gruesome-looking ankle injury in a loss at Miami. As bad a situation as the injury might be for Walker and the Titans, someone has to step in. It might have been Cunningham, who joined the Giants out of Southern Connecticut State in 2014, has Pruitt not been available. “I’m going to keep going. I still have that love and passion for the game,” he says. “So I’m going to go as long as I can. Cunningham said playing for his two younger brothers, Miles and Justice, has kept him motivated through all the trials and struggles of trying to stay in professional football. Nevertheless, Cunningham hasn’t been sitting idly by waiting for opportunities to come his way. When the Titans summoned him back on Aug. 7, Cunningham was already working toward his next career. “I was working as a personal trainer, because my goal and aspiration is to own a gym one day,” he says. “So I figured that while my career was in question, and I didn’t know if a team was going to call me or not, I figured I might as well pursue that field and learn as much as possible. Cunningham says he knew he had to do something to get noticed after arriving in training camp so late. That “something” was the blocked punt against Minnesota. He says that earned him a little more time to stick around. “Coming in late, I’m at the bottom of the roster, I figure, if you make a standout play on special teams, you’ll be around for a little bit and at least get a second opportunity,” Cunningham says. And maybe even another chance to realize his dream.